Three folks sit in a coffee shop, sharing a lobby and craving caffeine, but the similarities end there. A grad student, pinning his hopes and dreams of joining MIT’s PhD program on his ability to juggle a 6-week research internship and a 60-page thesis, throws back his fourth double-shot of the day. Across the room, a 30-something-year-old architect patiently sips a latte, focusing on the patterns of the caramel drizzle and suppressing the urge to chuck the beverage at the computer screen. Grandma’s sweet face sits in the Skype window, eyes squinting. She just doesn’t understand why the “damn mouse” opens a new tab every time. Two tables down, an experienced engineer preps for an interview, tapping her foot and checking and rechecking departure times for her three o’clock flight. She busies herself reviewing the nuances of Node, in hopes of both calming her nerves and anticipating any upcoming curve-ball questions. She has time for a quick refill and one more mental run-down on why her freelance work has equipped her for a mid-career transition to application-level development. Three different career paths, three yummy coffee drinks, three unique individuals — and one tool that could help them all. TechTerms is an online repository of curated technical terms and their plain-English definitions written by Per Christensson. With his help, we were able to explore how this tool can be beneficial to a broad user base with varying levels of technical proficiency in a myriad of professional or educational fields. Per Christensson developed TechTerms to serve as the plain-English dictionary and reference source for technical topics. It’s the 21st century. When you’re at a loss for what a word means or don’t understand a topic you come across, you turn to the Internet. We all just want to comprehend without a convoluted elucidation that obfuscates more than it illuminates — we want a simple explanation. That’s where TechTerms comes in. In the early 2000s, Per started pulling from his experience in computer science and communications, as well as his familiarity with the Internet from exploring it in its early stages, to create a curated dictionary of definitions for technical terms — written in layman’s terms. It’s the market-specific reference dictionary for anyone working in, studying, or curious about concepts related to hardware, software, systems engineering, or the Web. Imagine if the Skyping grandma from the coffee shop could have typed “double click” in the search bar. Aspiring tech professionals should try TechTerms as well — talking to the future MIT grad with the espresso addiction now. Per told us that he’s received a lot of feedback from educators and he sees a lot of the site’s visitors coming from the student demographic. Mr. Double-Shot could have just had TechTerms open in another tab while cranking out that thesis. 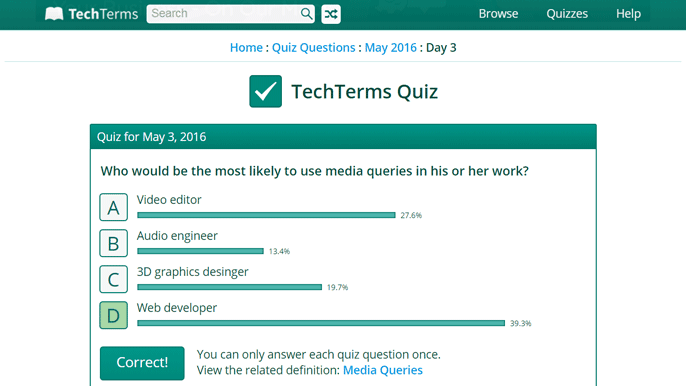 Test yourself on your proficiency in an array of technical topics using TechTerms’s quiz feature. Of those metrics, he’s also found that the easier questions get a much higher submission rate than the tough ones, even though there’s no grade or cost or penalty of any kind to answering. “People don’t want to answer a question that they don’t know, but if they know the answer, they love to answer and get the positive feedback,” he told us. He followed up by saying that the high response rates in general make him want to “triple-check” the answers across the board. “Every once in a while, I tick the wrong answer — and believe me, I hear about it,” he said. 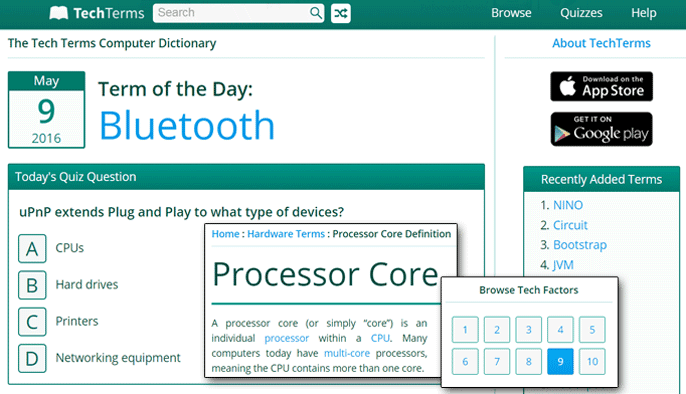 While the Tech Factor of a term would appear to indicate the level of technical proficiency required to understand the term, Per clarified: “It’s really based on common knowledge.” In other words, well-known terms like “mouse” and “website” have a 1 Tech Factor, whereas “dynamic website,” “processor core,” and “root directory” have a 5 Tech Factor. My recognition of terms ended in the 9 Tech Factor category and most of the 10 Tech Factors were just letters to me. Readers can also find a specific term in the auto-complete search bar or browse by categories: Internet, Hardware, Software, Technical, File Formats, Tech Acronyms, or Bits and Bytes. So what’s the technology under the hood of the site that houses know-how on all things technical? A quick run through Builtwith and you’ll find that it’s hosted by Liquid Web, is mostly a PHP house, and has jQuery thrown on the frontend. What you won’t notice at first glance is the sleekness and intuitiveness of Per’s code underneath the hood of TechTerms. To back it up, Per Christensson, Founder and President of Sharpened Productions and the author of all TechTerms entries, experienced the Internet in its infancy. In a recent chat with our team, Per recalled his feelings about growing up in “the swell of the Internet” as it made its entry in the late 90s. “I was fortunate enough to be a part of that generation and also have the technical aptitude to go along with it and get a handle on it early on,” he said. In ’99, he launched a site in hopes of (a) actually helping people while (b) not having to update the content daily (i.e., not an “ephemeral” news site). 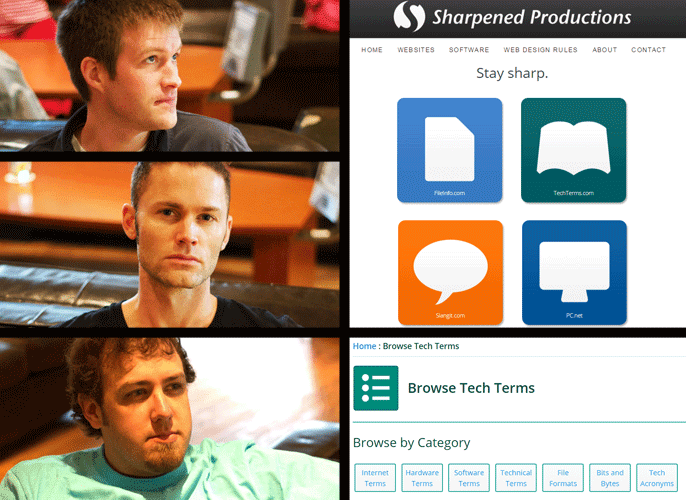 The site featured several resources to help users “sharpen [their] knowledge of computers and Internet” and it evolved through a few domain name variations before eventually becoming the company he manages today: Sharpened Productions. After graduating from Wheaton College in Illinois with degrees in computer science and communications, Per honed in on one particular tool he found to be pretty popular: the online glossary of technical terms. It just took a little negotiating for the right domain and TechTerms was up and running in 2005. Today, TechTerms is one of several sites owned by Sharpened Productions, so Per divides his time between being the CEO managing that company and maintaining and broadening the definitions on TechTerms. Coming down the pipeline, categorized quizzes (i.e., Buzzfeeds style) are a new feature Per told us is in the future. Meanwhile, the company is proud to introduce a new curated dictionary to the Web: Slangit.com. This is essentially the PG version of Urban Dictionary, so for family-friendly references to popular slang, look no further. Whether it’s technical jargon or lackadaisical idioms that have you perplexed and browsing the Web for understanding, Per and his team at Sharpened Productions have the plain-English answers for you.